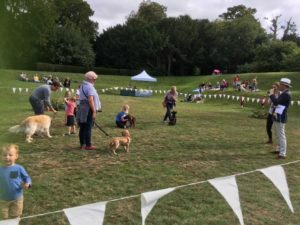 Last Sunday, the Moot hosted a plethora of dogs of all ages and types on its Sunken Lawn for the annual Dog Show. Some of those present were past winners, and others were completely new to the game, including 12 week old Zola (am I biased or not!) – well always best to get them socialising as young as possible! 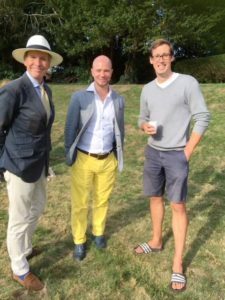 Mr Hamish Dunlop once again donned his Panama and compèred the event, trying hard not to offend the owners or indeed their pooches in his ignorance of breed. 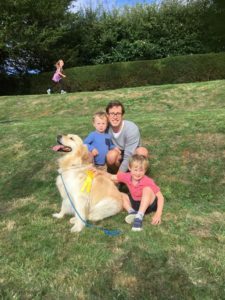 This year Downton resident and Forest Veterinary Practice Vet, Alice McLeish, kindly offered her services as Judge, and she was fabulous. 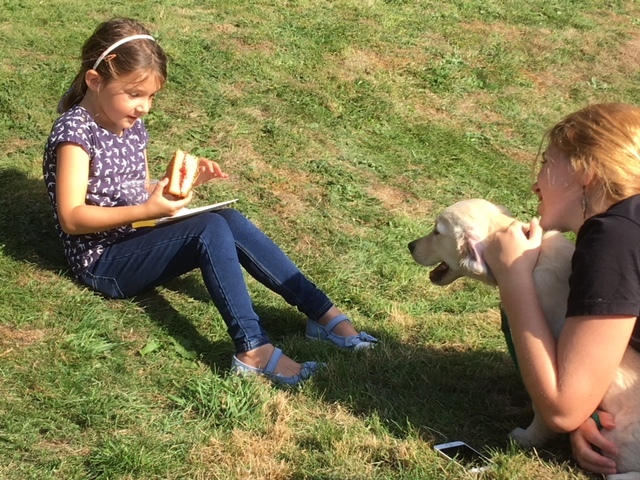 She quite honestly loved the dogs, finding it hard on occasion to make that final decision about…the Winner. Rosettes were handed out to 1st, 2nd and 3rd places, but there were doggie treats for all 4-legged participants, whether the Prettiest, the Most Handsome or with the Waggiest Tail. Fleur Fillingham, resplendent in shooting attire, gave a fascinating insight into bird retrieval by her 3 German Shorthaired Pointers, Pinto (aged 13), Flint (aged 6) and Salix (a wee pup at just 23 weeks). Audience participation came from young children, required to hide a dummy rabbit and pheasant, without those pesky dogs seeing! Flint brilliantly retrieved them. Salix was excellent in the Puppy Dog Demo. Mandy and Lesley were in charge of the ever-popular Agility – often more popular with the children doing it than the dogs themselves. Charlie Greville-Heygate tried to get Retriever Rafa to go through the tubes by demonstrating himself. With cream teas and cakes served by members of the Friends of the Moot Committee and musical support by Jeremy for both the audience and the participants – everyone was catered for.